I'm going to share a little family history today that will lead to one epic segue. I'm German so I have an Oma and Opa (gramma and grandpa). Whenever my family went to visit Oma and Opa in Buffalo we would have a delicious meal prepared by Oma and then we would retire to the living room where Opa would break out his accordion and my sister and I would dance around the room in circles. I remember this very clearly because the accordion has such a specific sound to it and that sound is created by a very unique squeezebox (yes that is the real term, look it up). So let's take a page from Opa and look at some beautiful accordion skirts. 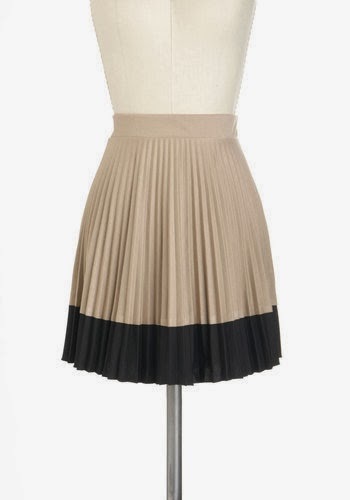 I love the high waisted fit of this skirt because its a bit ballerina. 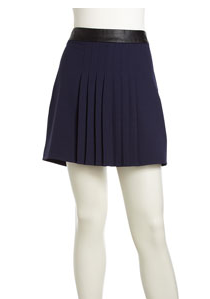 A beautiful navy with a contrasting waistband is professional while still perfect for twirling. A great contrast skirt that is a great length for 9-5 with tights and some booties. The patterned mini is so unusual with this type of pleat. In my opinion this skirt is basically a neutral to be paired with any other color like merlot or forest green. One of my favorite things about the accordion skirt is the movement. It's flouncy and girly but paired with the right top or motorcycle jacket you can make it edgy.